I, Gabriela Monsanto, have single-handedly found the best dairy free ice cream available - don't worry, you can thank me later. Whenever I venture home to Long Island I am desperate to find good dairy free desserts. In New York City I have my designated vegan dessert locales. Unfortunately, Long Island is not as advanced as New York City when it comes to vegan dessert offerings. To satisfy my palate over the Holidays I decided to try a variety of dairy free ice creams. 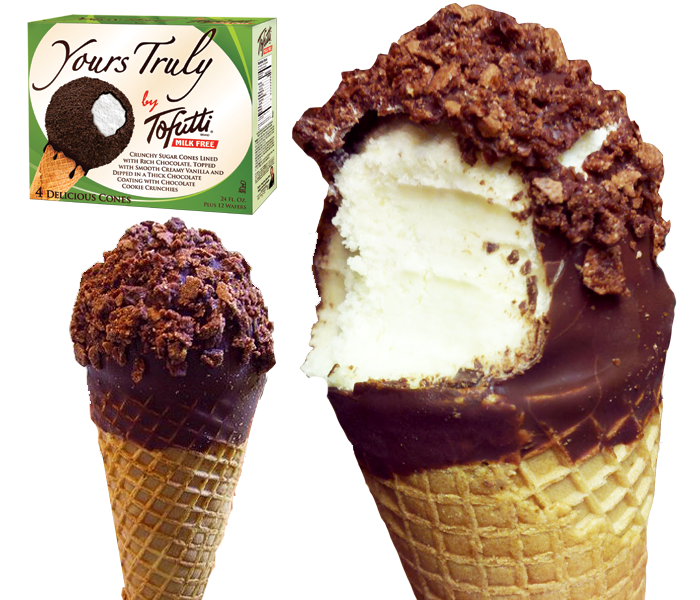 While perusing the frozen section of Whole Foods I came across a box of ice cream cones called Yours Truly by Tofutti. The taste of Yours Truly ice cream is above and beyond any dairy-inclusive, pre-packaged ice cream cone. The top of the cone has a crunch like covering and the cone itself is coated inside with chocolate. The ice cream is incredibly sweet - in no way do you feel as if you are eating a tofu product. After browsing the Tofutti website I see that there is also a chocolate version - my fingers are crossed that they sell the chocolate option at the Columbus Circle Whole Foods! *Collage created by Gabriela Monsanto. Photographs taken from Tofutti, Popsugar, Chicosandbeans. I love ice cream. It is my passion.sample essay writing I would like to taste this one.